An adorable old fashioned newsprint box filled with 4 packages of Whittington's jerky (1 2oz. 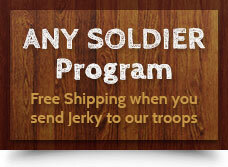 package of each - original beef jerky, hot beef jerky, traditional turkey jerky and hot and spicy turkey jerky), one 7oz. package of Texas Trash, and one Lammes chocolate bar.